The eighteenth century was an era of giddy scientific progress and the rejection of outdated beliefs. Observation and reason challenged preconceived notions about science, with the effects rippling into the religious and political spheres. 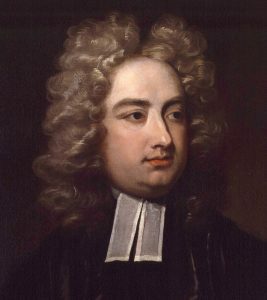 Jonathan Swift was probably the most astute and innovative satirist of his age. As a High Anglican, Swift was greatly suspicious of the political and intellectual motives behind certain scientific ‘breakthroughs’. Recently, I reread Gulliver’s Travels, and found myself marvelling at the satire embedded in the third book, which focuses on Gulliver’s voyage to the island of Laputa. I just had to share this with you! Who was Jonathan Swift, and why did he hate Sir Isaac Newton? Jonathan Swift was the Dean of St Patrick’s Cathedral in Dublin, and was very active in the Anglican Church throughout his life. With this in mind, you might leap to the conclusion that he did not fully comprehend the work being done by Fellows of the Royal Society (established in 1663). You could also assume that Swift’s aversion to Newtonian science was merely symptomatic of a natural hostility between science and religion. However Swift was an inordinately complex satirist, and he objected to Isaac Newton’s ‘innovations’ for a number of reasons. Newton was at the helm of the Royal Society, which found itself the target of much criticism from scholars who found much of its work intellectually contemptible and culturally subversive. The gentlemen scientists were ridiculed for a number of reasons, primarily for the pedantry and lack of practical usefulness in their studies. Their pomposity and self-regarding seriousness often hilariously contradicted the trivial and vulgar objects of their enquiries. Newton’s scientific discoveries were certainly controversial. For example, Newton’s discovery of the composite nature of light was ingenious, yet to the 18th century mind it served no purpose. 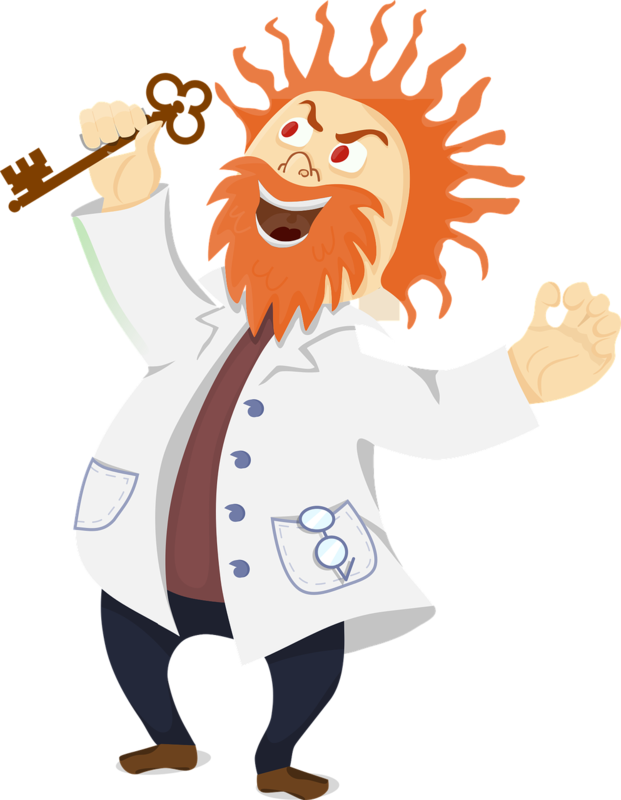 Swift exhibited utter contempt for abstract science or technology – as you can tell by his bitingly satirical treatment of the useless scientists in the third volume of Gulliver’s Travels. He was not however opposed to science if it could be employed to benefit mankind and thus was not anti-intellectual, only condemnatory of vain and extravagant experimentation that wasted time and money. Swift also astutely realised that science was essentially ethically and morally neutral and that it could be exploited for both evil and good. Gulliver’s Travels may on the whole be perceived as a satire on the scientific approach of the Royal Society. 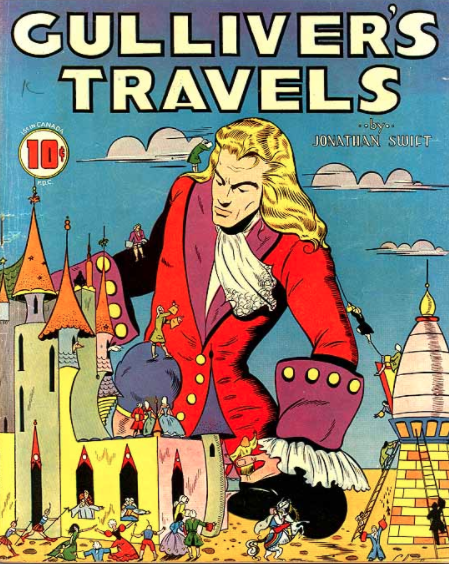 Swift used the travel narrative format, reporting on the curious and phenomenal sights and experiences of Gulliver in foreign lands. The novel is characterised by a calm, detached manner of writing. This in itself satirises the Royal Society, who often encouraged travellers to record their changing environments in minute details through astronomical observation, happenstance, hearsay, formal experiments, mathematical proof and field work. This format lends Gulliver’s Travels an air of authenticity, while also parodying the Royal Society. Gulliver discovers Laputa, the flying island (illustration by J. J. Grandville). Wikimedia Commons. “The Flying or Floating Island is exactly circular, its Diameter 7837 Yards, or about four Miles and a Half, and consequently contains ten Thousand Acres”. “Proposition and Demonstration” which have been “written on a thin Wafer, with ink composed of a Cephalick Tincture.” Of course, “Success hath not hitherto been answerable,” but that is of no concern to the Masters (Swift 2003, 232). Map of Laputa and Balnibarbi for the 1726 edition of Jonathan Swift’s Lemuel Gulliver’s travels into several remote nations of the world. Wikimedia Commons. Flappers? Not what you think! “It seems, the Minds of these People are so taken up with intense Speculations, that they neither can speak, or attend to the Discourses of others, without being rouzed by some external Taction upon the Organs of Speech and Hearing” (Swift 2003, 199). With such a vivid mental image, Swift draws the outline of a familiar stereotype; the scientist who has become so engrossed in his special field that he has lost contact with moral, social, or practical reality. “Most of them, and especially those who deal in the Astronomical Part, have great Faith in judicial Astrology, although they are ashamed to own it publickly” (Swift 2003, 205). Is there any practical application to this knowledge? There seems to be no practical application of this knowledge; even the Laputans’ obsession with accurate measurements in the art of tailoring results in poorly-fitting clothes. Laputa’s inhabitants excel in theoretical learning and can solve all manner of equations, however they cannot build houses because their knowledge is “too refined for the Intellectuals of their Workmen” (Swift 2003, 204). “In the First course, there was a Shoulder of Mutton cut into an Equilateral Triangle, a Piece of Beef into a Rhomboides, and a Pudding into a Cycloid (Swift 2003, 204). 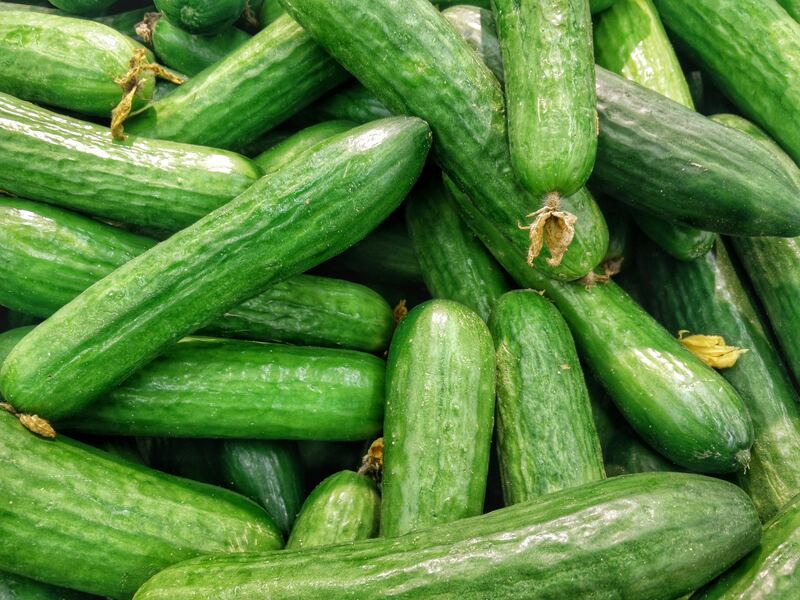 Can YOU extract sunshine from a cucumber? At the Academy of Lagado, Gulliver witnesses experiments that also serve no practical human use, such as one scientist’s attempt to extract sunshine from cucumbers. He describes in riveting detail the futile attempts of an eccentric projector who would do harm by inverting the uses of nature by breeding sheep without wool; “he hoped in a reasonable Time to propagate the Breed of naked Sheep all over the Kingdom” (Swift 203, 228); (Patey 1991, 817). You can tell that Swift was highly concerned with some experiments conducted by the Royal Society, which he considered to be inconsequential and of no material benefit; much like Newton’s experiments with light. The Laputans’ preoccupation with mathematics and predictions is actually frightening; they live in constant fear that “the Face of the Sun will by Degrees be encrusted with its own Effluvia, and give no more Light to the World,” and that the earth, “One and Thirty Years hence,” will be destroyed by a comet (Swift 2003, 205). While the Lagado Professors fantasise of new instruments which might enable “one Man [to] do the Work of Ten”, “the whole Country lies miserably waste, the Houses in Ruins, and the People without Food or Cloaths” (Swift 2003, 150). The detrimental effects of such self-obsessed studying extend to actual tyranny. These scientists literally have their heads in the clouds and are unconcerned about the plight of the poor people below them. 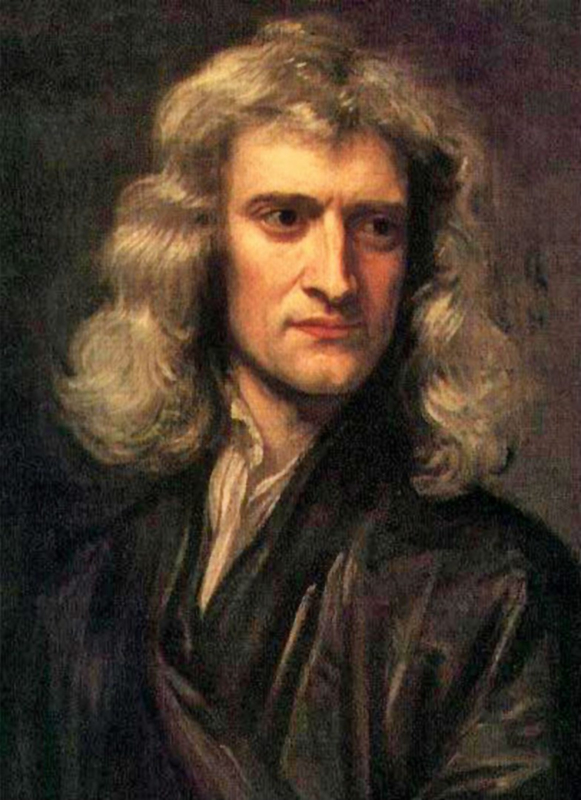 Swift felt that Newton’s science had a tendency to lead men away from their moral fulfilment. 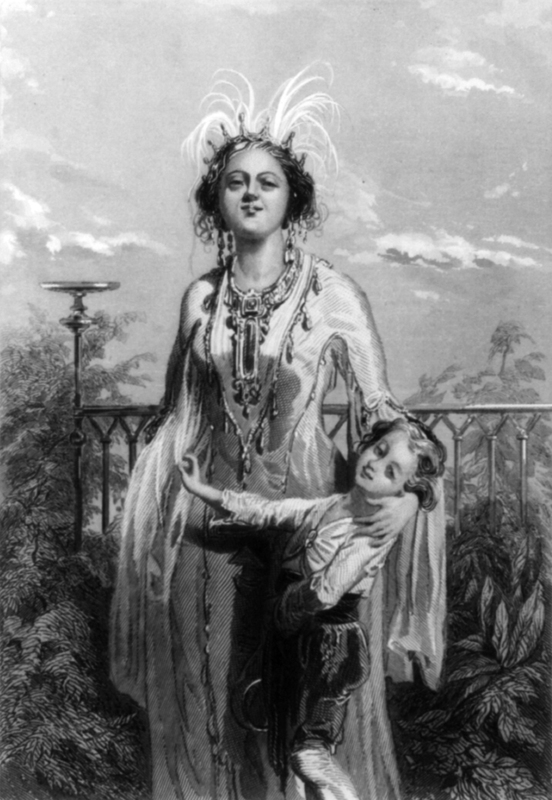 The Queen of Laputa, from a French edition of Gulliver’s Travels (1850s). Wikimedia Commons. Laputa hovers above the colony Balnibarbi. 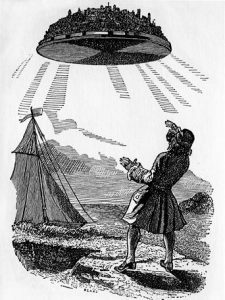 Much in the same way England exploits and oppresses Ireland, Laputa is used to subdue Balnibarbi by depriving them of the sun or the rain, by hurling down boulders, or even crushing rebel cities by “letting the Island drop directly upon their heads” (Swift 2003, 171). “strong disposition I observed in them towards News and Politics, perpetually inquiring into Public Affairs, giving their judgments in Matters of State, and passionately disputing every inch of a Party Opinion” (Swift 2003, 205). Despite this seemingly genuine appreciation on the part of Gulliver, Swift reveals his true disdain for the scientists’ meddlesome natures when Gulliver comments that he has “indeed observed the same Disposition among most of the Mathematicians I have known in Europe, although I could never discover the least Analogy between the two Sciences” (Swift 2003, 205). Ultimately Gulliver concludes that this “quality” arises from a “very common Infirmity of Human Nature, inclining us to be most Curious and Conceited in matters where we have Least Concern, and for which we are least adapted by Study or Nature” (Swift 2003, 205). So basically, Gulliver’s Voyage to Laputa comprises a hilariously satirical depiction of the Royal Society and in particular, Newtonian science. Throughout his depiction of the ridiculous scientists and the ineffectual or alternately dangerous implications of their experiments, Swift reveals his disdain for the self-important gentlemen scientists of the Royal Society. Both the political and philosophical reasons for Swift’s dislike of Newton are clearly and vividly illustrated; one cannot very well respect the Royal Society when their experiments are reduced to extracting sunshine from cucumbers.